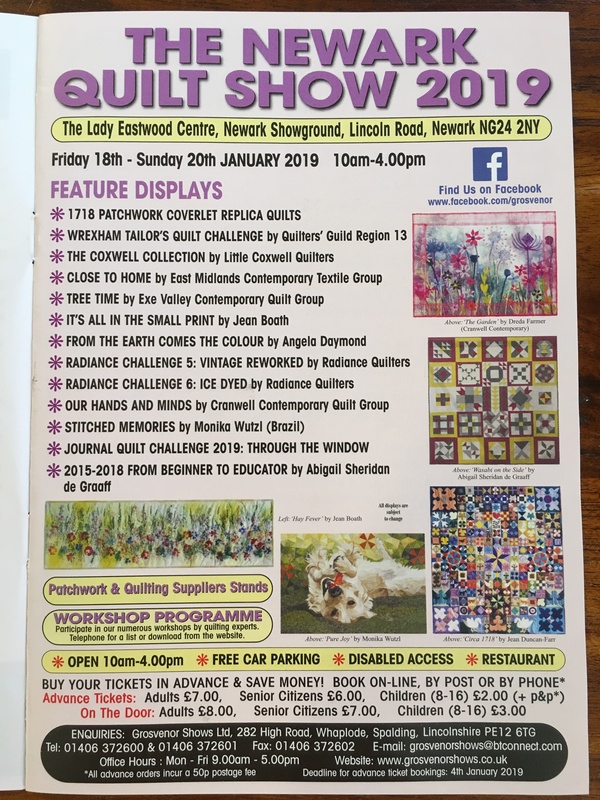 This weekend sees the first Quilt Show of the year at Newark Showground. It is a show run by Grosvenor Shows and this is only its second year. 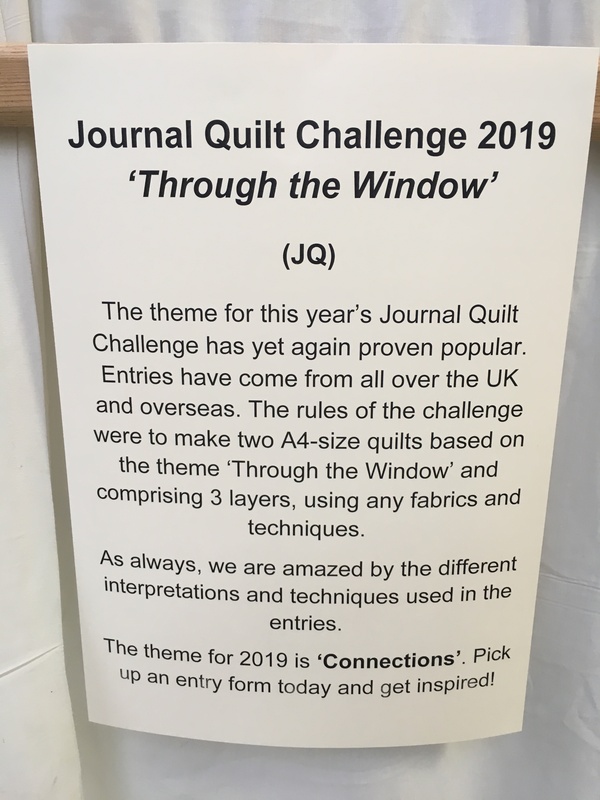 I didn’t go last year but was very eager to go this year because some of my quilts are one of the Featured Displays. 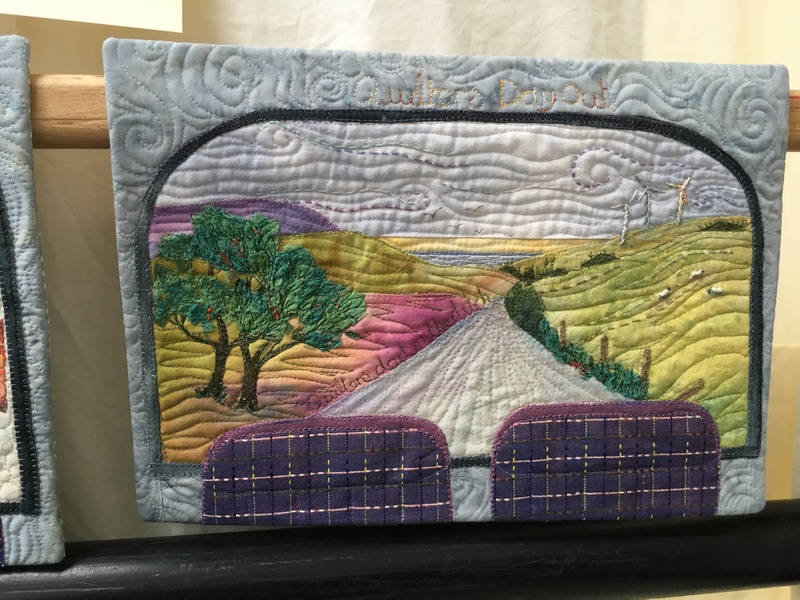 Quite a while back I was delighted to receive a call from Grosvenor Shows asking me if I would like to have a touring display with them and of course the answer was a resounding yes. 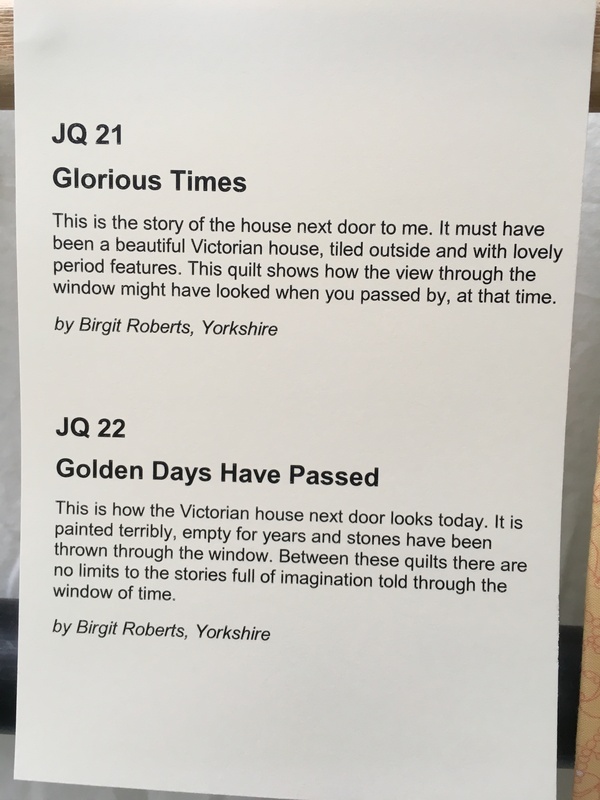 Don’t forget too, the website competition winners you have all been voting for over the last months will be on display at the Great Northern Quilt Show in Harrogate in August. 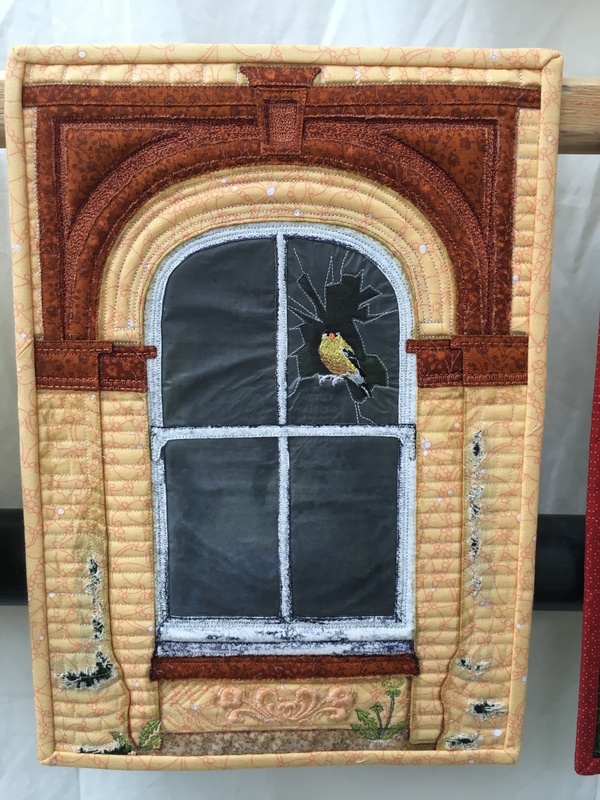 But back to the Show ….. what did it offer? Well the first thing that struck me was how cold it was! I have never been to a quilt show so early in the year before and this morning I was scraping ice off my windscreen. 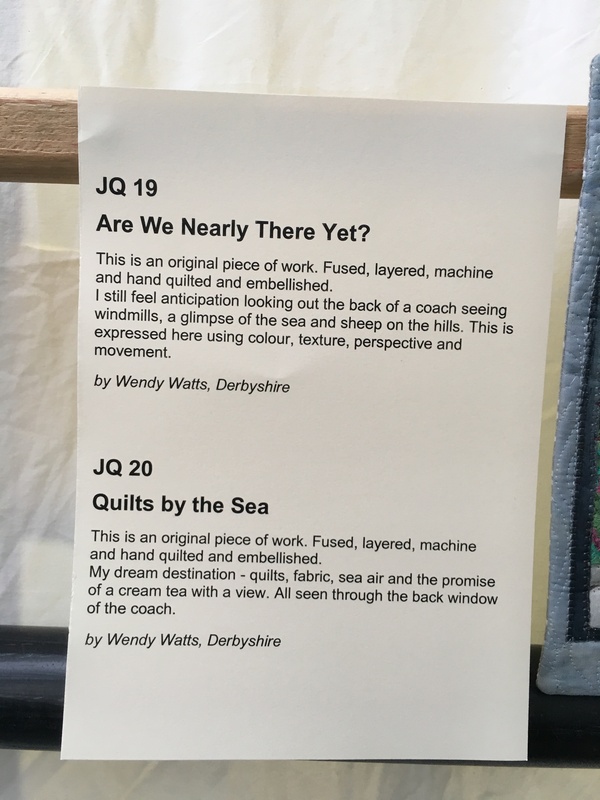 I did find that I kept my coat on all day long which is a far cry from Festival of Quilts in a heatwave. 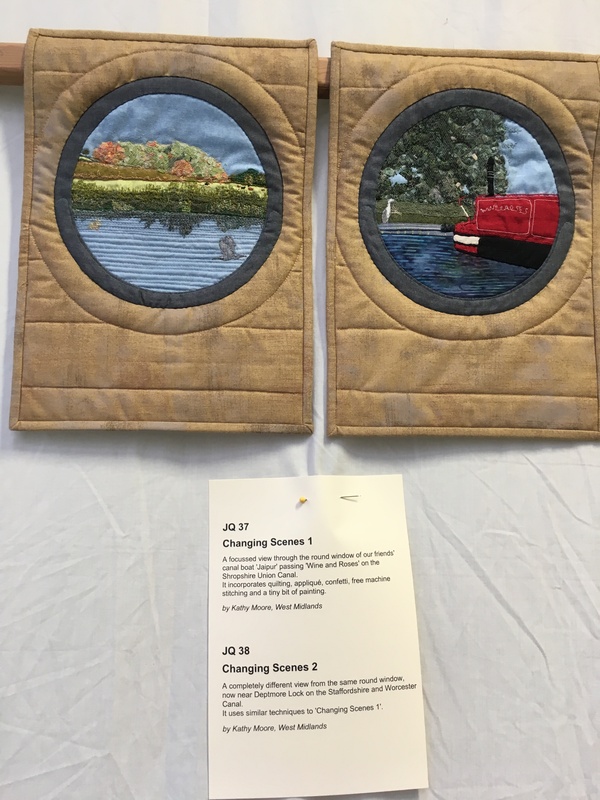 There were lots of displays from various quilting groups and so, even though there were not any competition quilts, there was plenty to see. When the doors opened there wasn’t a mad crush and you had lots of space around all the quilts and shopping was actually pleasurable. 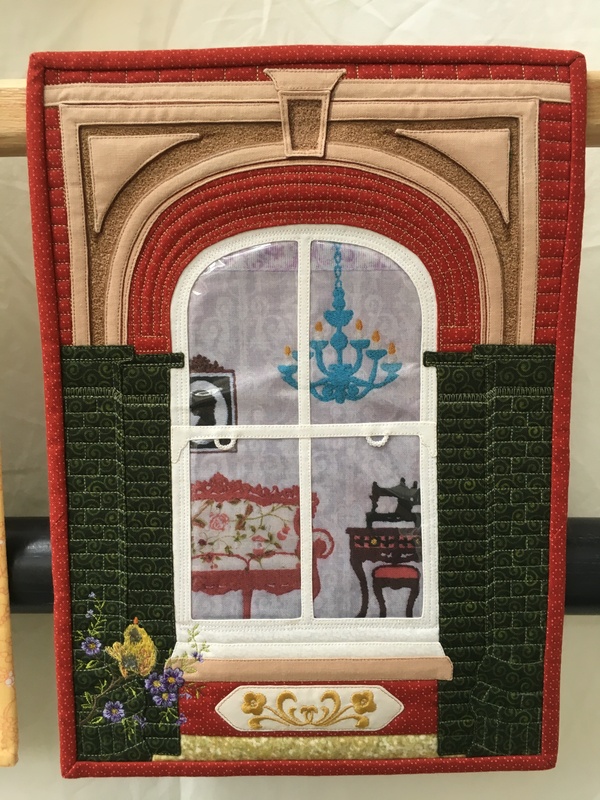 The parking is very close to the hall so all in all it is an easily accessible show.There was a good variety of traders and it was lovely to see some that I had not seen before – there were some gorgeous French embroidery kits that almost made their way into my bag! There are short workshops which can be booked as you arrive. I took one with Hilary Jackson which was most enjoyable but nothing yet to show and tell because I was chatting a lot! 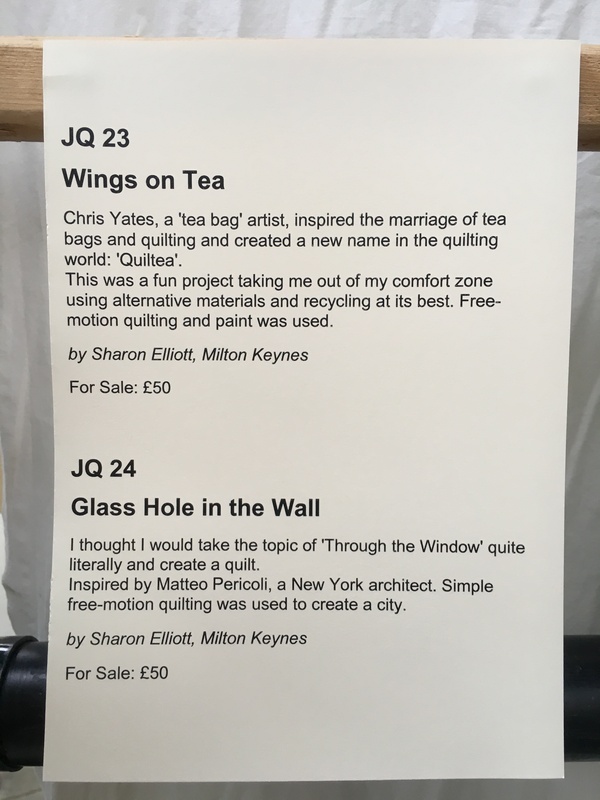 Isn’t that the wonderful thing about quilters? You can walk into a room knowing no-one and you leave an hour later having made connections and, in my case, putting a real face to an Instagram name that I know. 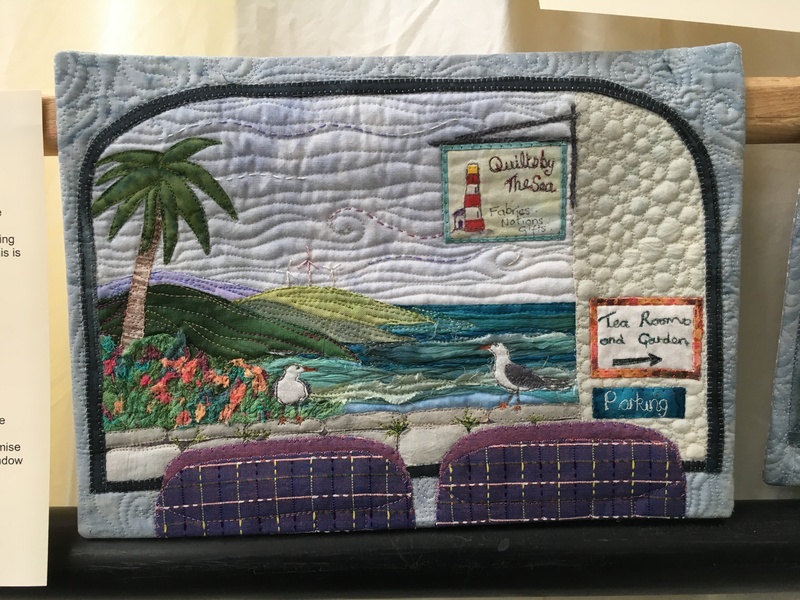 In this post I have focussed on the Journal Quilts because each time they blow me away. People are so creative with the theme and manage to fit so much detail and story into such a small piece. I think my favourite quilts at the show today where these two little ones. 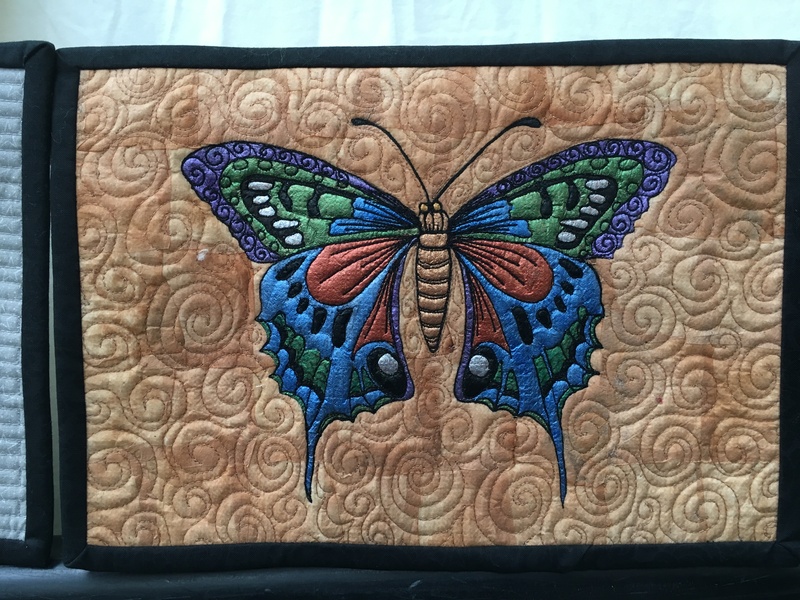 They are a far cry from my style of quilting but I just fell in love with the detail and the execution was amazing. All you have to do to be in with a chance of winning the tickets is to comment below. That’s it – really easy!! A winner will be picked on Monday 21 January and I will post the tickets to them. The Newark Show runs until Sunday at the Newark Showground, with free parking for everyone and is well worth a visit. 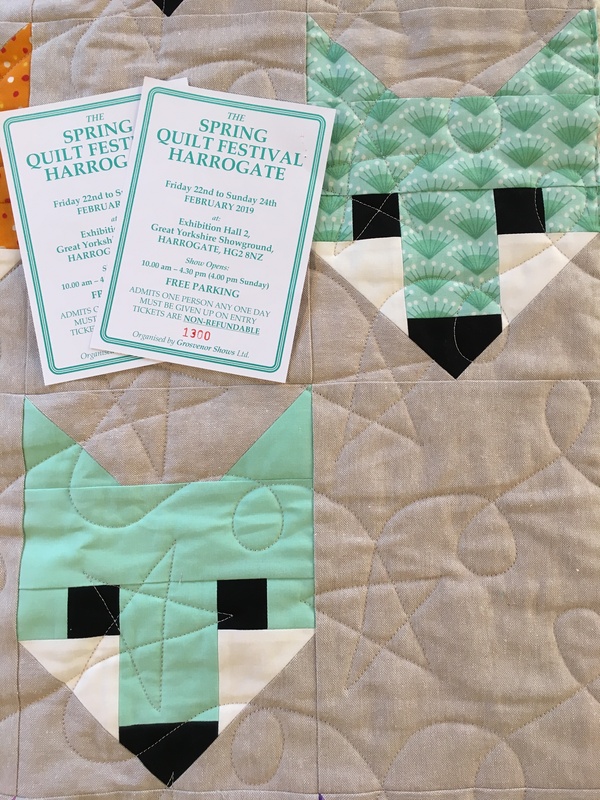 Don’t forget , the website competition winners you have all been voting for over the last months will be on display at Grosvenor Show’s Great Northern Quilt Show in Harrogate in August. Thanks for a great review, looking forward to seeing some of those beauties in Harrogate! Enjoy Harrogate! Good luck with the giveaway. Love a show, always new inspiration new people to meet, and an opportunity exchange cash for fabric! Love the ‘exchange cash for fabric’!! I actually did very little of that this time. Congratulations Mary, you have won the tickets from the giveaway! I have PMd you from the website. The PM is through FB because I couldn’t get it to go on here! Congratulations you are the winner of this giveaway!!! I will PM you (on FB) for further details. Many, many thanks, I have now responded via fb. I hope you enjoy Harrogate! Good luck with the giveaway. 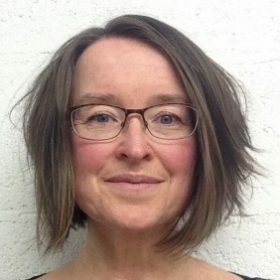 Fantastic blog, I love going to shows. I would love to receive the tickets to Harrogate. I really hope one day my work will be as good as all these. 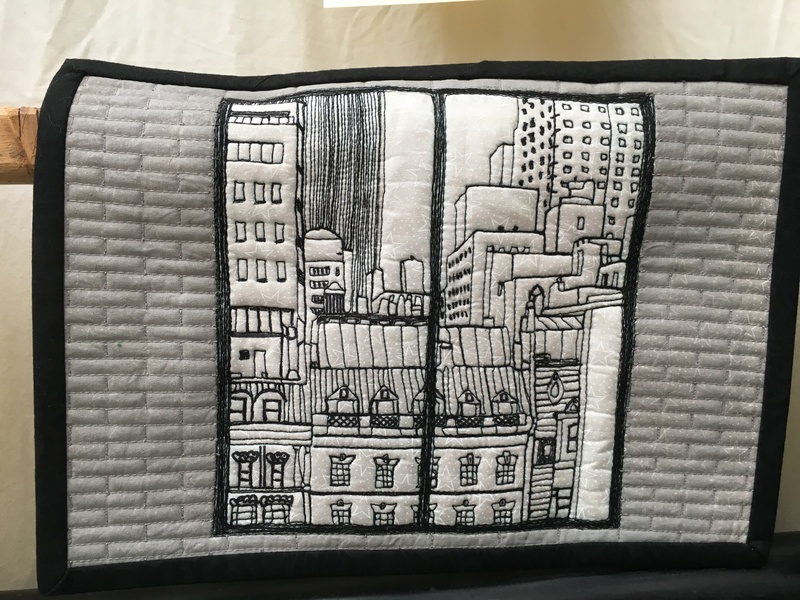 Your blog has inspired me just of to my sewing machine now. Thanks Ami. Every show I go to I see something I would like to learn to do – just not enough hours in the day!